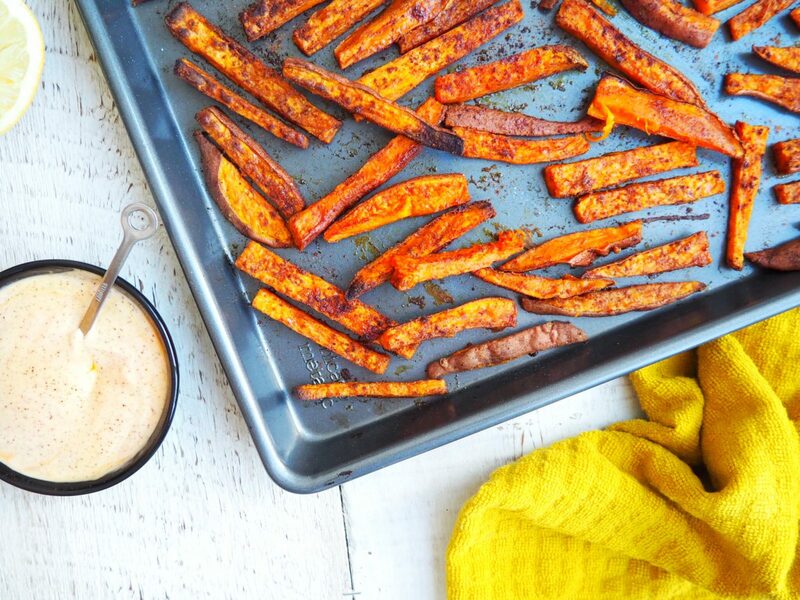 I’ve been making these sweet potato fries for years and they have become my signature side dish. I love making a double batch and having a ziploc bag full in my fridge cut and seasoned so I can just easily pop them in the oven for quick dinners or a harty snack. Preheat oven to 400F. Cut sweet potato into thin fry shapes and place them into a large bowl. Drizzle a generous amount of avocado oil and toss to coat the fries evenly. Season the fries with cinnamon, cumin, five spice, chili powder and sea salt. There are no exact measurements and can vary on how you like your fries. If you like them spicier, add more chili powder. If you want them sweeter, add more cinnamon… get the picture? Spread the fries on a baking sheet (I personally don’t line my sheet because I find that they come out crispier that way but you can also use parchment). Make sure that none of the fries are over lapping. Place in the oven for 40 minutes turning them half way through. To make the aioli, take 1/4 cup of avocado mayonnaise and place in a bowl. Add in the squeeze of lemon and 1/2-1 tsp of chipotle powder (again, varies on how much spice you like!) Stir until completely combined. When the fries are done they should have crispy edges, the thinner the fry the crispier they’ll be. Serve with the aioli, guacamole or just eat them on their own like me!